It’s 10:30 a.m. on a Thursday. Dr. Jon Chilingerian has just finished talking about the role of leadership in strategic thinking and decision making in healthcare, using a case about a real healthcare professional. He asked us for our own experiences and provided us with some frameworks to consider when facing similar challenges in the future. After break, we will be working with our study groups to apply the concepts we have learned in a simulated business experience. This afternoon we will learn about process analysis with Dr. J. Bradley Morrison in Operations Management. In the course’s introductory session earlier this week, we played an interactive game that introduced and framed many of the everyday operations challenges we might experience in our organizations. In this session, we will explore how to analyze these situations, determine how they occur, and discuss what we can do to alleviate them. At dinner tonight, we will be hearing remotely from Dr. Stuart Altman, our professor for the National Health Policy course next semester. He will be offering an informal “fireside chat” about the future of universal healthcare in this country and setting a groundwork for what we can expect during his class. When dinner ends, I will be going back to my room to work through some balance sheets for Financial Accounting. 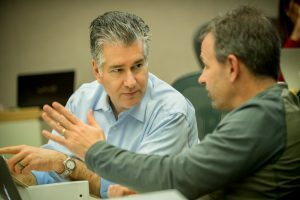 The schedule of Brandeis University’s Executive MBA for Physicians program is different from most traditional degree programs. Its creators sought input from numerous focus groups of practicing physicians to make sure the schedule responds to their varied and complex professional and personal time constraints. Instead of attending weekly class meetings over a 14-week semester, physicians complete coursework in shorter, more intense, periods of instruction designed specifically for a mid-career physician’s lifestyle. The program combines four rigorous 10-day residency sessions (with days similar to the one outlined above) with two to six hours a week of live, online coursework for a total of 16 months. Many EMBA programs require attending live residency sessions twice a month on weekends. Our design of four 10-day sessions reduces the number of trips and the overall amount of time away from work and family, while immersing physicians in a concentrated learning environment. In the ten days, participants rotate through half a semester’s worth of coursework with two to three classes a day and group work, guest speakers and prep time in the evenings. They learn, study, eat, and sleep all in the same facility – an executive conference center with many amenities that cater to this type of program. Participants make the most of the hours they have together studying with and learning from each other in both formal and informal ways. Physicians engage in powerful learning throughout the residencies, and coursework continues during the months in between with online sessions. These synchronous webinars allow classmates and faculty to meet to further discuss theories and their practical application. The webinars mirror a classroom as much as possible. Groups can meet in virtual breakout rooms, participants can share their screen to present to the rest of the class, faculty can lead case discussions, and guest speakers can engage remotely as they would in person. These sessions occur on Saturdays or weeknights and can often generate ideas that will be put into practice at work the very next day. Busy professionals need to carve out intentional time to engage in an educational experience. A program for working professionals should have a schedule that aligns with the needs of its participant and balances thorough, rigorous study with the reality of work and life. Heller’s EMBA for Physicians intertwines participants’ work and learning for 16 months to advance their knowledge and practice of the new science of medicine and management. This entry was posted on Wednesday, February 7th, 2018 at 5:57 pm	and is filed under Uncategorized. You can follow any responses to this entry through the RSS 2.0 feed. You can leave a response, or trackback from your own site.